Precious baby baptism rosary bracelet created with silver leaf jasper gemstones, Swarovski crystal Our Father bead and a sterling silver cross. Personalized with sterling silver letter initials. 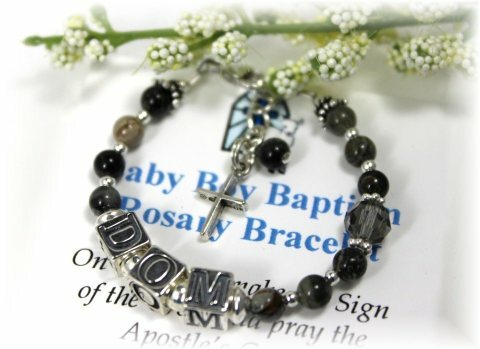 This precious baby baptism rosary bracelet created with silver leaf jasper gemstones, a Swarovski crystal Our Father Bead and personalized with baby's 3 initials or name in sterling silver letter blocks will be a cherished keepsake forever. Includes a gift card sentiment and box. Includes 1/2" extender chain and cross charm. Price includes 3 initials or letters - additional letters $3.50 each. 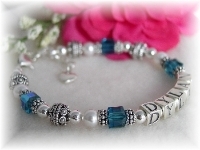 Please be advised that this bracelet's smallest available size (with 3 initials/letters) is 4-1/4". This will fit MOST 0-3 month babies. 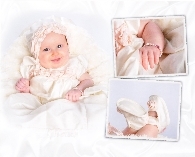 Our non-rosary styles are an option if you feel this will be too large for your child. If you choose the smallest sized bracelet (4-1/4"), please keep in mind that the more letters you choose, the longer your bracelet will become. 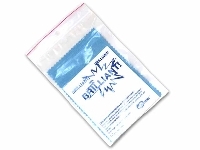 This is not considered an error in our bracelet sizing.